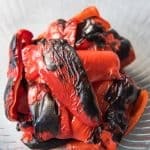 Roasted red peppers are not only wonderfully sweet, rich and incredibly flavorful, but they add wonderful color and beauty to many dishes and sauces. They are super easy to make at home instead of spending a fortune on the bottled ones you get at the supermarket. Set top oven rack 6 inches below the broiler. Preheat the oven to broil on high. Line a baking sheet with aluminum foil for easier clean-up. Wash and dry the red peppers, then remove the seeds, stems, and membranes. Slice each pepper into 5-6 strips and lay flat, skin-up, on the baking sheet in a single layer. Place the peppers in the oven, 6 inches below the broiler flame, and cook for 7-10 minutes, until the skins are charred black and wrinkled. Remove from oven and immediately place the peppers in a glass bowl and cover it tightly with plastic wrap. Allow the peppers to rest for 30 minutes so the peppers can soften and the skins loosen. Once the peppers are cool enough to handle, peel the charred skin away from the red pepper "meat" and discard the skins. Use immediately or store in a jar in the fridge with 2 tablespoons of olive oil for 3 days or in a freezer-safe bag in the freezer for up to 6 months.